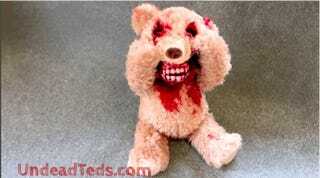 The horrifying Undead Teds bears are back. And now they've been upgraded to be even more terrifying. Behold the giggling, face-ripping Undead Teds Peek-A-Boo Edition. You've done it again folks—we'll be sleeping with the light on. This is not the first time we've featured the Undead Teds, but it may be the most horrifying. Undead Teds are available on eBay.